Editor's Note. Clear concise communication of what benefits semiotics can offer potential clients in the context of market research has long been a key challenge for commercial suppliers of applied semiotic and cultural analysis. Looking back on London's Semiofest 2012, the first annual gathering of commercial and academic practitioners, and looking forward to the imminent second Semiofest in Barcelona in May/June 2013, this article explores a number of questions still calling out for answers in terms that can be immediately convincing and persuasive for the non-specialist. This piece is much longer than anything we normally accept for publication (our essays average 600 words or so) but its timeliness and wide-ranging character make this an irresistible Semionaut proposition as stimulus for thought. One of the keynote presentations at this year's Semiofest is entitled "Making Semiotics Useful". That's also, implicitly, the challenge of this paper: how do we persuade people that this stuff, in all its varieties, is actually useful, comprehensible, good for something? A challenge which must, surely, speak ultimately not just to the commercial applied semiotician but also to the academic trying to persuade students of the value of semiotics-based studies and justifying research funding. After having attended Semiofest 2012 in London, the first global conference on applied semiotics, we have some confidence that we, as semioticians, are in a position to evaluate the global practice of semiotics in a marketing context. We are in a position also to define a range of practices and better define the term such that all applications fit within. As semioticians, the barrier to our future success depends on our ability to simply articulate the definition of semiotics and the value it offers in business context. In order for it to be simple to understand, we must describe it without using words like synchronic, diachronic, discursive, etc. This document is an attempt to define the state of the practice to us and to the larger arena of marketing, branding and product development. The benefits of which is that we might manage perceptions of semiotics, take advantage of the opportunities as well as sell semiotics more effectively. The creators and organisers of Semiofest are clearly on a mission to unify the global semiotics community, encourage the sharing of ideas, and increase the commercial value. To date, semiotics has been difficult to promote. It has been hard to define and package nicely into a digestible proposition that all marketers can comprehend. There is just enough information out there to make it both intriguing and confusing. The promise of having a sound methodology for uncovering the meaning of signs appeals to many, but has caused its traditional definition and application to be altered, adapted and fastened onto other insights gathering disciplines (such as neuro-design, brand strategy, design strategy and traditional marketing research). Definition and clarity about semiotics was also a challenge for the global audience of practitioners and academics at Semiofest 2012. During the event, we as a community were unable to articulate it in such a way that it served people for the variety of disciplines that find its usage meaningful. But failure to better articulate and manage the perception and relevance is a liability to all that seek to make a living from applying the ‘science of signs’ in marketing, branding and design. Semiotics is the study of decoding and recoding meaning by understanding the signs and codes manifested in culture and absorbed or expressed by each human being. The identification and interpretation of signs and codes allows us to understand the meaning and relevance of concepts and objects without the problematic task of asking people directly what matters to them. Rather, those signs and codes are confirmable by a process of deductive pattern recognition as well as use of the semiotic square for proving dichotomies between patterns that align with a common denominator of meaning. If the dichotomies do not make sense, then the quality of insights will be held in question. It appears as though the application of semiotics can be matrixed from the decoding in insight gathering to recoding of signs in product and brand development and from the psychological analysis of human perception of the sign to the anthropological analysis of sign meaning in culture. We are a signifying species and we project meaning onto the objects around us. Those that follow the logic of Charles Sanders Peirce believe signs are universal and that everything is a sign. Whereas those that follow the logic of Ferdinand De Saussure believe that the meaning of a sign has purely to do with its relevance within a culture. The Peircian approach lends itself best to an understanding of those instantaneous assessments (unconsciously or consciously) we make of objects in our world. Signs, according to Peirce, can be anything — a hand gesture, a facial expression, the painting of the Mona Lisa, the steam that comes off a hot pot, or the crucifix. The meanings of signs then, include cultural effects but also are perceived in a way that precedes culture, impacting us all the way down to the neurological and animal level. Sign interpretation reflects our self-perception, triggers unconscious emotions and stimulates our salivary glands. With this point of view, Peircians tend to focus on perception and the immediate impact and amplitude of the sign on us psychologically. The dominant themes in culture are compelling to Peircians, because they appear to confirm universal truths (or at least points of view that seem to be revealingly widespread and consistent across cultures) about the nature of perception in all human beings. According to Ferdinand De Saussure, the sign is a symbol — already an abstraction deriving its meaning from the broader cultural signification system — the world exists because we determine it. It appears Saussure did not concern himself with questions about the nature of perception and the deeper unconscious in his definition of semiotics. Therefore semioticians following Saussure function more as anthropologists studying the communications, traditions and relationships exclusively in culture. They focus not on the immediate impacts of the sign, but rather on longer-term impacts of signs on culture. Commercial semioticians inspired by Saussure tend to see dominant themes as all too common and ultimately inclined to lose their appeal and saliency for people, triggering a creative challenging to produce ever more innovative brand communication. For all semioticians, branding is a comfortable fit for professional application because branding is really a process of attaching meaning to a product. If a brand is successful in attaching meaning to the product and branding persuades people to buy, then they consume the sign and its meaning by consuming the product. However, due to these foundational differences in semiotic theory, Peircian and Saussurian semioticians have drifted apart, to separate hemispheres of the brand development process. The implication of this basic difference has a tremendous impact on the marketability of semiotics and the confusion about its usefulness within the industry. If we can articulate how and why each is practiced distinctly as well as identify areas for greater integration, the coherence of the offering will improve. Peircian semiotics leads naturally to its application in synthesis phases of brand development (bringing the brand to life). Peircian semiotics and brand design share something in common. They both tend to favor the perceptual experience and immediate reaction of the consumer to the brand and product. The focus tends to be on the make-up and appearance of the physical object or artifact. Merely the idea of making design beautiful implies that there has been special attention given to the composition of elements that make up meaning. Therefore, Peircian semioticians often act as consultants in the optimization of design such that the composition of signs immediately triggers the intended response. The response may have to do with amplifying cultural relevance. But it may also have just to do with amplifying such immediate and primitive responses as salivation or emotions like anger or joy. Saussurian semiotics leads naturally to its application in analysis and insights gathering phases of brand development. It could be due in part to semiotics staying true to its roots in abstract areas (linguistics and cultural anthropology). Saussurian semiotics tends to be used for the purposes of brand meaning or product benefit innovation. Saussurian semiotics has become applied in business application as a detection system where, through the identification of residual, dominant and emergent themes, it tracks the movement of an ideology. Saussurians thus tend to be somewhat removed from brand expression phases, because there is less focus on the nature of perception of discrete signs —the focus in more on abstract themes and codes. Semioticians that lead by cultural analysis – that is of the abstract symbolism and language – will naturally produce output that must be handed off to someone else for design translation. At best, when we are uncovering insights that pay dividends, semiotics would be used end-to-end to decode meaning in culture and recode meaning to create meaningful, persuasive brands. Therefore, integrating what is best of Peirce and Saussure, promises that holistic solution. If we are addressing the longevity of a brand that, in theory, should transcend cultural shifts, then we have to look at more universal truths. Also, if we are developing a brand in which the needs of the consumers are less about the reflection of identity and more about the resolution of deep visceral and emotional needs (such as in pharmaceuticals), then using Peircian semiotics to find universal signs that communicate the way the product or brand will resolve those needs is critical. It’s less about how one identifies with the product and more about what that product will do to rescue that individual. Perhaps the best semiotic insights will integrate both schools of thought to address both the primitive, deep unconscious and the more superficial collective unconscious – in effect, a semiotic square that integrates the psychological component and the cultural component. 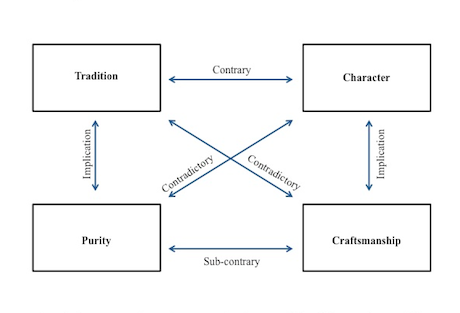 Likewise, Peircian semioticians who have traditionally worked on brand expression should consider Saussure and exploration of cultural ideological shifts so they too can be involved more upstream during brand meaning and product benefit innovation projects. Spending as much uncovering cultural ideology shifts as in the nature of perception will enable Peircians to develop signs and code that fascinate consumers versus just giving them the assurance that the brand is fulfilling their needs. What is a Commercial Semiotician? A commercially applied semiotician is often not a singular occupation. It is a sub-occupation of an individual who is delivering to market an offering in which semiotics adds value. These are perhaps those trained in an array of qualitative and quantitative consumer research techniques that have extended their practice into cultural analysis. These might be design strategist who has recognized the value semiotics brings to demystifying the design making process and in providing logic for converting brand meaning into strategically codified design. Those that are classically educated semioticians might argue that those who stake claim are not true semioticians and part of the cause of the proliferation and dilution of its credibility and reputation. In truth however, those who do practice semiotics commercially, but thoughtfully and dutifully, who are molding and adapting the science to support their work are doing so, partially out of a desire to make a living in a burgeoning field they feel passionate about. Being a discerning fundamentalist may be a luxury in which the semiotician is a devoted academic and not necessarily compelled to make the discipline marketable. So to many the commercial application of semiotics that originates in the European (Saussurean) academic heritage may appear to be an exclusive right as well as a premium offering reserved for the minority who are recruited by businesses with the forethought, patience and financial resources to afford to explore cultural context broadly and map out opportunity spaces for product and brand meaning innovation. So is semiotics a methodology that can be adopted wherein rigor is maintained by adopting certain frameworks and procedures or does the semiotician require some formal training and verification? 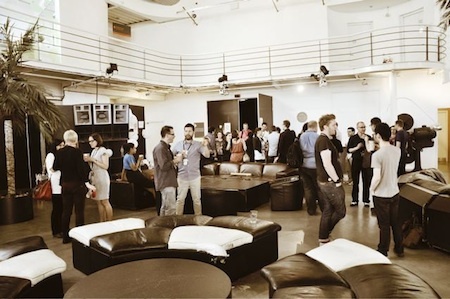 At Semiofest 2012, one of the few top marketing experts with experience on the client side stressed how important it is for semioticians to use more common language and make the practice more accessible. The legacy of semiotics has traditionally been academic. While it is the substance of its worthy esteem, it can be a liability if the sophistication of the offering disillusions prospective clients. The challenge then is how to keep the intellectual engine running strong, but silently ‘under the hood’ so the client can eventually take the wheel and drive forward with greater vision and clarity. If the client cannot convert the insights into more compelling brands and products, then the mainstream, commercial value of semiotics shall remain in question. Our ability to make it attractive requires that we very simply define it applicability and the benefits as well as where they fit within current conventional practices of building brands. Certainly there will be some compromises to be made in order for it adoption to increase. Many of those who understand the power of semiotics perceive it as a premium offering for those with the luxury of spending time and money, beyond reacting to current demands from consumers and threats from competitors, exploring emergent themes to proactively insure the future relevance of their brand and products. But expanding the market for semiotics has begun to take shape. In the U.S.A. semiotics is being used to improve the coherence and desirability of brands in their current state. Middle marketers and business unit directors value semiotics for its ability to fix brands with fragmented meaning and whose stewards have lost their way. In contrast to its luxury version, the desirability of semiotics has to do with enabling brands to deepen bonds by way of the gravity of dominant cultural themes. In fact, the emergent, intriguing cultural theme might be perceived as a somewhat risky — an untested territory of meaning. For better or for worse, dominant themes appeal to brands seeking to increase their market share in the now and who are unwilling to jeopardize their share of the category in its current state. If appealing to the mass market is the prize, what then is the added value in rigorously decoding meaning and looking for patterns? The answer to this question requires a shift in perception and an expanded role of semiotics. In addition to operating as only an outside consultant, contracted as an analyst who informs meaning, the semiotician can further add value as a synthesist who curates meaning. In this form, the semiotician is not an outside consultant. The semiotician is rather an internal steward, insuring that the deployment of brand codes and signs are precisely meaningful and resoundingly desirable…despite the revolving door of and distance between brand stakeholders. In fact, the ability to do so has been the pain point of many business unit directors and global brand managers seeking to build brands with the utmost care but then unsure about how well those insight will be interpreted by different agencies or others responsible for bring the brand to life in a meaningful way. In partnership with the designer, the semiotician can make inroads into brand expression and activation both as manifestations of brand meaning and purpose. Deeper integration of semiotics and design will enable the semiotician to become an expert in the deployment of brand design-encoded meaning that also carries with it the important cultural and consumer insights. In general, however, semiotics for business application has been leveraged in pre-design phases and more upstream business and brand strategy planning. The challenge with this approach is that, because it connected with linguistic semiotics, there has historically been less of a clear and obvious link to recoding brand expression and design. If this is true, then the designer is the semiotician’s ticket to greater prosperity in the business context, especially where semioticians benefit from insuring that coded meaning finds its way to the street to reflect back on to consumers what they initially found meaningful and sensorially captivating. The semiotician needs the designer to fulfill their proposition and ensure the semiotician’s insights pay dividends. Part of the promise of success in marketing application has to do with the ability to recode and see to it that meaning is re-engineered for brands. The creation of precisely meaningful design is the best semiotics can do to start to visibly demonstrate ROI as well as expand the practice into other levels of the marketing community. In order for the business application of semiotics to expand, the designer must play a larger role because they are intrinsically more connected with the brand delivery machine and the day-to-day design projects required to bring semiotic insights to life. Conversely, semiotics offers the designer something in return — to legitimize and give structure and voice to the previously quiet and unconscious process of the designer (who might just be the most marvelously equipped to decode meaningful signs as subtle as those that show up in typography and letterform structure). With meaning decoded, the integrated team has the potential to elegantly orchestrate precisely meaningful design solutions. The ability of the designer to function in this different, strategic capacity (distinct from the designer who is craftsman) requires they have a unique identifier – design semiotician. To earn this definition, the designer will have many added responsibilities. They have to become, as Tim Brown from IDEO describes, T-shaped – vertically integrated, with the creative gifts of a craftsman and horizontally integrated with the ability to recode semiotic insights (and business objectives) into desirable, meaningful design. Before going forward, we must clearly articulate the differences between the design semiotician and a traditional semiotician, although the functions of the two often overlap. Any time a traditional semiotician is decoding an advertisement and looking for patterns in relation to other ads, they are behaving as a design semiotician – although the design semiotician will often be treated as a specialist, deconstructing such an advertisement to understand the meaning in details such as letterforms and photography style. The design semiotician is both decoding visual language and recoding design solutions. The design semiotician is as different from the traditional semiotician as an archaeologist is from an anthropologist — regarding physical artifacts as crystallizations of consumer culture, such as competitive pressures and consumer desires. If life were a movie, the design semiotician is watching that movie with the sound turned off — the component of language is not a leading consideration. The design semiotician is paying more attention to immediate perceptions and emotional appraisals of signs and codes. Whereas the traditional semiotician is paying more attention to the way signs and codes reflect broader culture relevance and ideology. The design semiotician is a specialist, well suited to evaluating the quality of persuasive marketing, paying particular attention to the amplitude and theatricality of designer-choreographed signs and codes. While the traditional semiotician is paying particular attention to the context of signs and codes in culture, the design semiotician is considering that same context in addition to the context within category in which those signs and codes solicit. In the United States, design semiotics has emerged as companies have recognized the importance of controlling the expression of brand meaning across a vast field of global brand stakeholders. Semiotics has become the backbone of the design strategist who is tasked with insuring that design expression born out of business strategy and consumer insights is as true to life as can be – and that there is someone who can create a master plan for understanding how to deploy the use of signifiers and codes. Despite the benefits of deeper partnership and integration between semiotics and design, there remains the challenge of how to insert this expertise within the well-established, conventional chain of strategic brand communications. Those who traditionally function at the translation point between brand strategy and brand expression (the brand strategist on one side and the creative director on the other) may not be so willing to share the space. Yet there has heretofore existed a blind spot between wherein the insights are recoded and deployed in such a way that thoroughly informs the creative director as well as any other brand stakeholder responsible for managing the expression of brand meaning. Perhaps a larger challenge to the adoption of design semiotics has to do with the unease designers feel about the demystification of the design making process. Historically, the designer has been entrusted to use their artistry to create products and brands that sell. But as the stakes rise in categories, the mysticism must be replaced by measurable and manageable design. Semiotics (decoding and recoding) has generally been well received as a form of verification and valuation of design’s efficacy. If we can surpass the challenges stated above, design integration could create unforeseen opportunities for semiotics to add a discipline about the strategic deployment of signs and codes in the marketplace. For example, one of those opportunities has to do with capturing the interest of the shopper. Especially since the design semiotician can be to the traditional semiotician, what the marketplace is to culture. The design semiotician, (as one who has experience addressing the immediacy and amplitude of impact of signs and codes) can provide an expert point of view on the optimization of designs that rise above the noise and chaos of the store. To do so, the semioticians must understand the rules of engagements in the store, the tactics of the competition as well as how to manage perceptions of the brand portfolio at the shelf through a visual strategy. Semioticians must also understand the conventions about how particular product and brand benefits are communicated through design—How is authenticity communicated, how is luxury communicated and how much do brands have permission to deviate, differentiate and still communicate coherently? Making semiotics more credible and worthy of the confidence of skeptical marketers was a pattern of its own at Semiofest 2012. Several semioticians, in one form or another, presented methods of making the quality of semiotic insights more measurable and parameters for pattern recognition more autonomic and controlled. There were attempts to truly capture consumer self-disclosures (without the consumer’s awareness that they are being watched) from an N the size of total population of consumers the end product intends to serve. Thus far, the perception of relevance and truth of semiotic insights depends on the quality of demonstrable pattern recognition and deductive logic. To this point, semiotic insights based on the analysis of a single advertisements is largely debatable. Historically, semioticians have also relied upon a framework of dichotomies (the semiotic square) as a logical proof. If the dichotomies fit, then the range of meaning is presumed to be true. But there is still risk of some subjectivity. The challenge for semiotics is in creating a stronger reason to believe by providing greater evidence and proof that the decoding of meaning is logical and scientific. Semioticians are also trying to harness and deconstruct the mechanics of sign significance shift so that we may ultimately become better at forecasting emergent themes and innovation opportunities. There are also attempts to quantify the results with software that scans images, thereby providing proof of consistency in evaluation and scanning methods and removing subjectivity. During Semiofest 2012, there was an effort not only to understand how to measure the quality of semiotics, but also to discuss the perception of reward the client perceives it to offer. In order for return in investment to be insured there is, at best, some physical manifestation of semiotic insights that creates interest and sales. Traditional commercially applied semioticians are doing the immensely important job of understanding what is the kernel of meaning. But they are somewhat handicapped in terms of being able to evaluate the ROI if they are handing off their findings to the client. But often times, the brand development team, for whatever reason, fails to deliver on those insights. The traditional semioticians often work with creative teams to insure insights are translated effectively. But there is a limit to what can be supervised. The best these semioticians can do is inspire and empower creative teams to carry semiotic insights through to all brand communications. They are not prescribing specific element but rather outlining what elements within a range are ‘on code’. To earn semioticians entrance into all phases of the product or brand development process requires that they cut their teeth in the broader milieu of the marketing organizational culture, using familiar marketing language and sharing in day-to-day brand deployment challenges. Semioticians have to be somewhat flexible, willing to adapt and simplify their methods to serve the needs of clients. Semioticians have to explore the category almost as much as they explore culture. They have to understand how the shopper is different from the consumer in culture. And they have to understand how to strategically deploy brands, balancing the use of culturally meaningful signs and codes with brand equities and visual signs of competitive gamesmanship. Over the past ten years there has been an increasing amount of research addressing the shortcomings of consumer insight gathering by asking the consumer directly about their unmet needs and feelings. If there is a gradually increasing skepticism about self-report based consumer insights, then perhaps this explains the apparent appeal and attractiveness of semiotics. The promise of semiotics might be that the sign is regarded as an undeniable manifestation of those things that are meaningful to people and can be decoded and analyzed to uncover consumer values, while side-stepping the risks associated with asking the consumer directly about what they want us to believe matters to them. While the ability to collect thorough consumer self-reports may enable brands to offer the consumer a degree of satisfaction or fulfilment, such insight does not enable these same brands to use this insight to guide them toward defining new ideological spaces that will fascinate the consumer and truly differentiate from competitors. In theory, if all brand meaning were created around fulfillment, then brands and categories would actually begin to converge in meaning around the commonly held motivations that bring people into the category – rather than differentiating from each other, to which brands commonly aspire. By using semiotics to understand human behavior and manifestations of cultural ideology, there is an opportunity for brands to identify opportunities for social disruption and finding true white space. Another important theme in this area of semiotics versus traditional qualitative research is that self-reports do not always reflect purchase behavior. There has been a growing tide of thought-leaders who have warned us about this. Most of human experience of the world and appraisal of surroundings is processed at an unconscious level. For example, if a consumer has negative feelings about body image or financial status, we draw upon those when seeking that miracle product, yet we do not bring to the store shelf, the full weight of those emotions. On the contrary, we find ourselves delighted and intrigued by the proposition as well as taken by rational consideration about the choices. If this is true, then the best way to determine meaning is not to ask what the consumer feels. If we aren’t to ask the consumer directly, our options are either to use neuroscience to get inside the black box of the human brain to track down the powerful origin of purchase decision processing (a venture which has not yet been perfected or embraced) or we can evaluate the way that meaning and identity have been reflected in culture, precipitated in the signs and codes that resiliently withstand the test of time. Semioticians would like you to believe that, unconscious or not, the intent and desire of people can be interpreted in aggregate through the analysis of culture and the identification of patterns of meaning decoded from human artifacts. Part of the risk of direct interface with consumers is that we can only assume the relevance of meaning to the culture or likely users. The attractiveness of semiotics to marketers likely has to do with the ability to uncover consumer insights about meaning and desire with an N so large, it undoubtedly reflects the full span of the bell-curve of the target audience. Uncovering meaning in culture promises sales volume. Traditional consumer insight methods (i.e., ethnographies and focus groups, where consumer are asked what they need and want) can make a claim that semiotics cannot — providing marketers with the assurance of knowing that the insight came directly from the consumer’s mouth (however well that insight reflects purchase decision). Also, referring to semiotics as a true science is debatable. Absolutely, there is rigorous deductive logic, but we can never 100% guarantee that our analysis is without some subjective bias or perceptual fixation. We can never be absolutely sure that a process of uncovering every rock along the evolutionary path to contemporary relevance confirms the historical context of meaning we may have identified. Adding rigour, process and transparency constitutes one more key challenge and opportunity among the many currently facing commercially applied semiotics. There is no conclusion, as such, to this piece. With the second Semiofest imminent this summation of the state of play right now is deliberately inconclusive, spontaneous, open-ended. One of the keynote speeches for the up and coming 2013 fest, as the editor's note prefacing this piece indicates, is “Making semiotics useful”. Maybe that’s a key dialogue we ned to engage with right now. In the spirit of making that undeniable usefulness for clients a reality please join the conversation. Starting with short responses in the dialogue boxes to this current piece – or further essays submitted to editorial@semionaut.net picking on some of the points raised here for discussion. 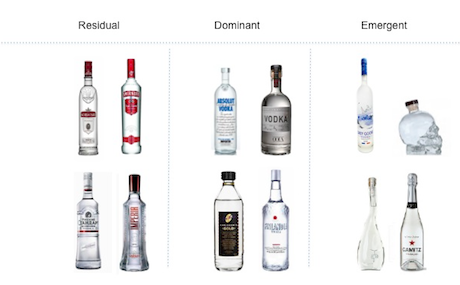 Originally, the vodka category drew on Russian and East European dynastic aesthetics and cultural cues to convey tradition and massivity/bulkiness (the Residual codes of vodka). There was then a period where Absolut focused on purity, which was symbolically prominent (the Dominant code). Grey Goose signalled a rupture by opening up the vodka category to a characterful interpretation (the Emergent code). 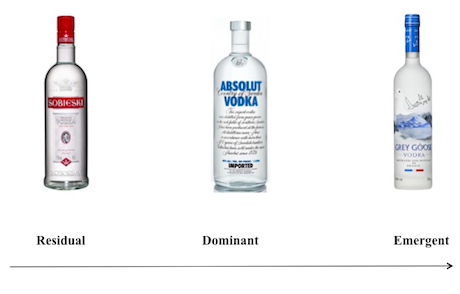 Sobiesky (Residual) and Absolut (Dominant) packaging can be organised according to their signs into two main poles. On one side is the pole of tradition, which claims vodka as a national treasure, and on the other side is the pole of purity, which stresses vodka freshness and transparency. Whilst textual codes, the Slavic writing on the Sobiesky bottle and the long text of Absolut, characterise the traditional category, Grey Goose subverted this by using image-based signification: a vivid interpretation of Frenchness communicated through the Tricolor colour coding and a drawn illustration of flying geese above a moving sea (the grey geese of foie gras and the nationally typical coastal/ maritime associations). As such, the move from emphasis on textual to more arresting visual codes enables Grey Goose to keep the codes of purity – the use of the blue, the fresh air of the sea – whilst freeing it from the traditional cultural cues in order to create a characterful interpretation. Relieved from vodka’s historic heritage, the bottle shape moves from the established sense of the massive and substantial to a more refined wine bottle shape. Purity is a current cliché of the vodka category and the key feature of Absolut’s brand differentiation. Yet Absolut’s purity is of a particular type, an intrinsic one. The bottle’s connotations of chemistry symbolize the concentration of an extremely sanitary liquid. In contrasting with this intrinsic purity, Grey Goose cues an extrinsic, ‘crafted’ purity. Drawing on a sophisticated version of the codes of purity, Grey Goose displays a refined artistic graphic, a delicate alliance of blue and grey tones, and the aforementioned elegance of the wine bottle. The theme of purity could be revisited through the use of raw material culturally encoded as ‘noble and pure’, such as organic white roses, to create an ‘ultra pure’ vodka and step even further away from the Absolut chemical purity. Cueing on the precedent of Lady Gaga’s first-ever black perfume, the purity of vodka could also be distorted into innovative dark vodka. Powerful, the theme of craftsmanship is opening the way for more global interpretations. One might imagine a Brazilian vodka made from Amazonian fruit. You are currently browsing the Semionaut blog archives for April, 2013.